Windows 7 has a very large number of accessibility settings to help people with disabilities use their computers.but sometimes the settings you're looking for might not be where you would think. For example when I started to need the use of a sticky mouse function I looked through easy access settings under "change how your mouse works"and found a couple of interesting settings, but none really useful to me. So I went about creating this sticky mouse auto hotkey script. Then, the other day I was having a conversation with the tech person for my rehabilitation facility and begun to talking about my sticky mouse script. She was very impressed with it and thought it worked very well. But she also pointed out that window 7 already had a similar function built-in which I did not know about. 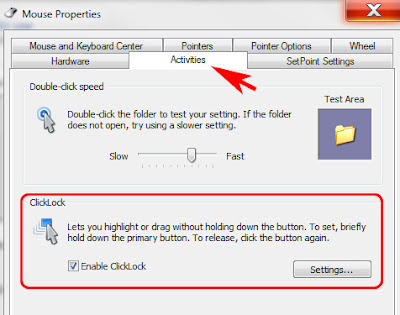 It is called "click lock" which you can find under the mouse settings. This surprised me because I really expected this type of function to be under "ease of access". When you open those properties, you'll find it under the activities tab. Just turn on the little check box. 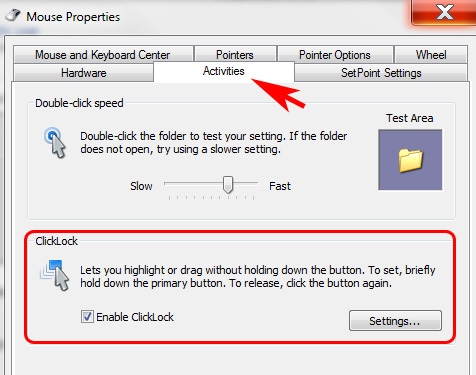 Let's click lock is enabled, you will be able to modify the timing before click lock activates the settings tab. It's controlled by little slider, in the same way that the sticky mouse auto hotkey script is. There is however one key difference and that is click lock does not give you any cute to indicate that it has locked your click. It is however more closely integrated into the Windows 7 operating system, consequently I would expect that it may have additional functionality/support that sticky mouse auto hotkey script does not. Admittedly, I'm probably a little biased to my sticky mouse script but there's one thing that I very much prefer. I don't need the sticky mouse functionality 100% of the time, therefore it's very easy for me to click off from the taskbar. Simply right-click, exit script. If I were to try and disable click lock, well I have to navigate through the space control panel down to mouse properties every time I would want to turn it on or off. I know this is minor, but there are more steps involved and thus making it a bit more inconvenient.